Here are some of the testimonials we have received regarding the use of our products. Please send in your questions and comments, and we'll publish them for the benefit of all our customers! You look an awful lot like a guy I know by the name of Bill Rickman... except much older. My wife and I sailed our wooden ketch from San Francisco to Victoria, British Columbia. We were hesitant to enter the Wooden Boat Festival and be judged in the show competition as the boat was a little scruffy after the trip North. Then we thought of the can of your Stockholm tar given us as a going cruising present and, just as a beautiful woman adds fragrance for the ball, we dabbed a little of your product here and there. The effect of Uncle Billy's smell was astounding. 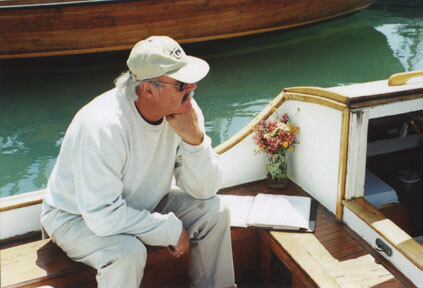 Visitors and judges alike commented "there is nothing like the smell of a real wooden boat". Of course our boat "Farida" never divulged her secret, and neither did we. with the award for Best New Classic 2000. Glad to have a source for Stockholm tar again. I love the stuff. I haven't tasted it yet, but it's probably good with a twist of lime. 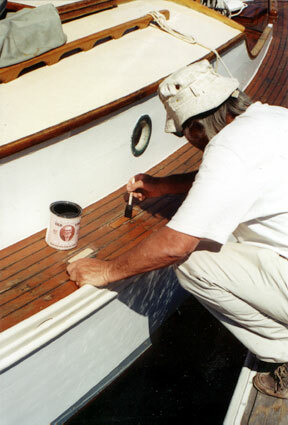 I've used Uncle Billy's Wood Oil in the cabin, on shelf grates, and outside on blocks, and boathook handles. So far I've used it on fir, oak and teak and it holds up well, and looks really good. It has that great old fashioned smell. We all want to smell like Uncle Billy. My girlfriend Laura (who placed the order) and I are using your oil while we're refinishing our pinky schooner. Laura used a little of the oil while working on another boat here in Pt. Townsend. The original can she used was picked up at the Wooden Boat Festival last September. We like the look of your stuff and we plan on using it on our cabin sides, hand grabs, companionway slides and sills. Probably on the cap rails too. Glad we tracked you down. Please see the enclosed photos of the plywood box on the back of my MAX 4 six wheeler. The box measures 65" x 29" x 12" with no top. My can of Uncle Billy's Old Time Wood Oil went almost two coats on raw plywood. I find scars in the wood (rough duty) show a deep penetration of oil. Uncle Billy's pungent odor is fairly strong at first, then fades within a few days. We are very pleased with the results using Uncle Billy's Old Time Wood Oil. The Historic Sloop Witchcraft, Maryland Y.C.